Staples junior Abby Lake eludes a Trumbull defender on Monday. Lake scores the only goal of the game in the Lady Wreckers' 1-0 victory. It's one thing to play on the road. 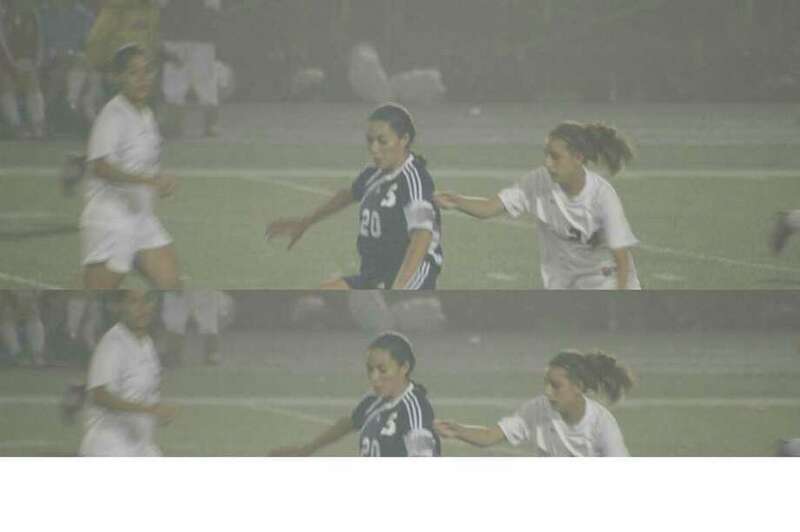 It's quite another to do so in the fog and rain mixture that pestered the Staples High School girls soccer team during a 1-0 victory at Trumbull on Monday night. "A bit unfortunate," Staples coach Nikki Ross would later call the conditions. "When the weather is like this.... It's really anyone's game. It was definitely nerve-wracking down to the last second." After establishing themselves as the aggressors in the game's early stages thanks to the spirited play of senior captain Jaclyn Katz, junior forward Abbey Lake, senior midfielder Nicole Brill and junior midfielder Abbey Fagan, the Lady Wreckers (2-1-2) were able to score the only game in the 20th minute. Sophomore forward Ryan Kirshner threw the ball into Lake, who with a Trumbull defender guarding her, turned and fired a shot that found the lower far corner of the net before Trumbull goalkeeper Jenna Rousso could attempt to get a hand on it. "I just took a quick touch-and-turn and shot as quick possible to try to take the goalie by surprise," Lake said about her second goal of the season. "It was just a perfectly placed ball [by Kirshner] and Abbey did a great job of shielding her defender to create the opportunity," Ross added. Staples prides itself on being more of a possessional team, which is an easier trait to have on a slower playing surface like the grass found at Loeffler Field. The slick turf field took away such aspirations on Monday. "The ball was in the air the whole time because it's very hard to put on the ground," Lake said. "You have to really have to have a lot of communication with your teammates." With 11 saves and the noteworthy assistance of senior captain defender Kelly Bohling, Staples junior goalkeeper Jesse Ambrose was able to shut out the Lady Eagles (2-3), a team who had scored a combined 13 goals in its two previous games. Trumbull's best chance to level out the scoreboard game in the 71st minute when Trumbull forward Emily Sambrook found room to roam before being met by a sliding Ambrose, who managed to deflect the ball away. A second later--perhaps two--the ball wound up at the foot of Trumbull forward Ana Tantum, who rocketed a shot into the waiting hands of Ambrose, who managed to pop up just in the nick of time. "Once I made that [first] save I didn't keep that save, so I had to be ready right away," Ambrose said. Staples will next play at Bridgeport Central at 4 p.m. Wednesday as the third game of a six-game road swing. The Lady Wreckers will not play on their own field until Oct. 11 versus Norwalk. Still, the team is not one to complain. "There is such a thing as home field advantage, but we don't feel like it affects us," Lake said. "Your game is your game and wherever you go, it should stay the same." "I think being on the bus together before games helps us a lot because it puts the team together," Ambrose said. "I don't take it as a negative at all." "It's a challenge but at the same time, I don't think--at least at this point--that the girls have let it affect them," Ross added. "I think it will only be to our benefit once we do finally get our home game [because] we should come out really strong."